Smoke told me the oven was hot. This is what Martha Stewart moments look like at our house. Shaving up curling cold spoonfuls of cookie dough from my chilled bowl of chocolate chip and butterscotch cookies, I mold and form them into balls. Three cocoons wait silent, suspended, and we check them often. "Do you think there will be a third butterfly tomorrow morning?" I ask Daniel as I kiss his face and pull the blankets up around him in bed. "Do they come out from their cocoons in the dark?" 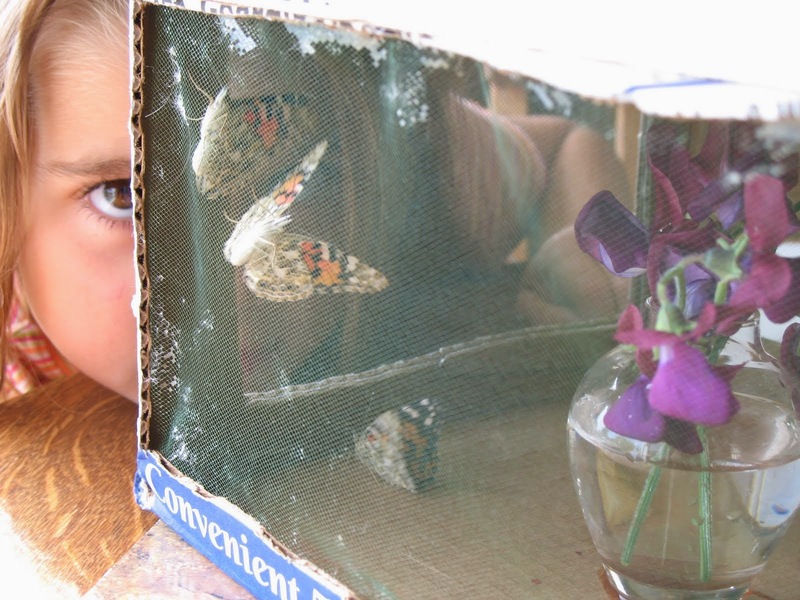 we wonder and stare off, imagining one, two, or three new butterflies the next day. We placed blood oranges in their box home this evening, slices of dark magenta citrus. They haven't eaten them yet, and we peek in regularly to see if they will. There's a passage in the Bible book of Acts that I have been thinking about this week. In Acts 24-27, Paul is in prison for his religious beliefs, awaiting trial and a chance to be exonerated. Two years pass. One brief sentence holds two years of waiting, and Paul sat in prison, delayed. I love that Paul knows who he is, and whose he is. He knows his God too. Describing this time later and an angelic encounter during a rough sea voyage, Paul says, "an angel of the God whose I am and whom I serve..." I love that Paul hasn't walked away from his belief in God, decrying injustice or defaming the character of God. "Of the God whose I am and whom I serve." This God to whom I belong and whom I serve.... this God whom, in fact, Paul says, "I have had God's help to this very day, and so I stand here and testify to small and great alike." In the waiting, in the two years passing, in the cocoon-like silence, great things were still happening. For you and me too. If you feel like this is an in-between time, a time of waiting, know that life is still stirring, forming, growing. Life is building for the unveiling. "I have had God's help to this very day," and so I stand here and speak. Me too. You too, my friend. The cookies are done and crumble hot chocolate in my mouth. Due to a shipping error, five more butterfly cocoons hang in a clear plastic jar nearby. Butterflies grow luminous under grey silk chrysalises, and the brochure tells us to wait. May I have one of those cookies. Rats! Guess I'll have to wait for it. :) My address is.... LOL Waiting is hard. Makes me admire Paul even more. Hi Bill, I agree -- both about the cookies and the waiting. Jennifer, you know I'm in a waiting time right now -- thanks so much for this encouragement about all that is going on while we wait. Very encouraging! Lovely to hear from you. Yes, that waiting stage is challenging at times, huh?